2018 CO-AGE Legislative Priorities are Set! Our perennial request is for increased funding for Home and Community Based Services, those services that keep seniors in their homes as long as possible. Our carryover request is for the creation of an Abuser Registry to prevent providers and families from hiring caregivers with a history of abuse. CO-AGE members chose three new issues. 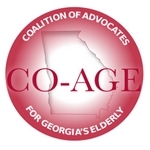 The top budget request was for additional funding for Georgia’s ADRC or the Aging and Disabilities Resource Centers and the top two legislative issues are allowing Medicaid Funded Assisted Living and Improved Personal Care Home Requirements. As Georgia’s older population continues to grow at an alarming rate, the need for access to information on aging options has exploded. Georgia’s ADRC network serves as a ‘no wrong door’ access point for these information services. Families can contact the ADRC connection to assess an individual needing services anywhere in Georgia. Because the state continues to maintain waiting lists for Home and Community Based Services, the need has increased for the enhanced services that ADRCs provide. CO-AGE members chose this important budget ask of $4 million to strengthen the statewide network by providing more capacity to meet this growing need. Unfortunately, there is a lack of affordable housing for people needing assisted living, that is help with activities of daily living such as eating, taking medicine, dressing and bathing. Medicaid funding for assisted living is currently provided through waiver programs that contain large waiting lists. CO-AGE members chose this important legislative issue because legislation could enable the state Medicaid program to pay for assisted living in a broader way by increasing the number of facilities and available openings. Because personal care homes across Georgia do not always comply with local licensing requirements for fire and code enforcement and put residents, staff and visitors at risk for health and safety issues, CO-AGE members want to improve those requirements. The rules currently have limits on the fines and sanctions that can be imposed when a personal care home does not follow the law. The maximum fine is $1,000 per day per violation but can be as little as $601 for first time cause of death. Legislation could provide more options for sanctions and as well as higher penalties.